Yeah we finally have a baby girl!! Oaklie Rogers, born 7-8-09 (which is cute because my wedding anniversary is 9-8-07! were ment to be a family)!!!! 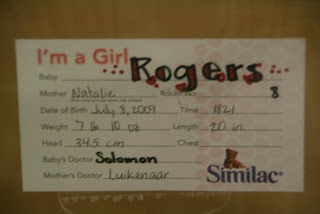 she was 7 pounds 10 oz and was 20 inches long!!! so after 12 hours of labor, 2 hours of pushing and an emergency c-section this princess finally decided to grace us with her presence! Here is the story of how she came!! We go to the hospital tuesday july 7th to start a pill call cervidel to help my cervix start to soften. I was contracting too much for them to be able to use it. They decided to hook us up to the potossum which is the medicine that helps you dialate instead. At 5:45 am on the july 8th my water broke. The nurse asked if i wanted an epideral, she said the anestesiaologist was getting ready to go into surgery and would be unavailable until 8 am. i said i would wait a little while, well... about 30 mins later i wanted one! So he quickly came in and gave me one and it was beautiful. They checked me at that time and i was dialated to a 3. 5 hours later the epideral starts to wear off and i'm in ALOT of pain. so the anestesiaologist comes back in to give me more medication.... we'll to sum it up i didn't get numb after a 30 mins. He was just amazed that i didn't get numb! she he took it out and placed another epideral into another vertibre and this time it shot pain on the side of my back. he was like "i've been doing this for 30 years and this should not be hurting there. i put it in text book perfect.". he said that it didn't hurt when he flushed it but only hurt when the medicine went in. so he took this one out and i got a 3rd epideral placed and this time i got numb. the anestesiaologist said that if i couldnt stay numb this time that the epideral probably wont work on me and i would be doing this natural! the nurse checked me at this time and i had gone from a 3 to an 8 in 5 hours! the nurse said that, that ususally dosent happen to first time pregnancys and no wonder i was in pain! A couple of hours later they checked me and i was completley ephased and dialated to a 10! yahoo time for pushing!!! right before i started pushing i noticed i didn't feel well, they took my temp and it was at a 102 and some how i had gotten an infection! So we start pushing and after every 3rd push i puked ALL over myself!! after an hour and a half of pushing my dr. said if she dosent come in 30 mins we would have to do a c-section becuse she should have come out because i was pushing just fine. she said she couldnt use clamps or a vaccuum to help because she couldnt see how the baby was positioned. During that time the epideral started to wear off, 30 mins later i was in some pain. so my dr. said "okay c-section time". as thor got dressed i got a contraction that contracted so hard i couldnt breath! it refused to let up and let off the baby so the dr. said no time we have to do this now! and wheeled me off to surgery! Once in the operating room i was NO longer numb at all and i was screaming and crying and couldnt breath due to the contraction that still would not let up! The anestisologist said "were gonna have to put her under i cant get her numb!" So since i was being put under thor wasnt allowed in the operating room. Luckily i had asked my nurse from my ob office to be there with me. since she was a nurse she was allowed in the room, Florance (the nurse) came to the hospital on her own time to be there for me and was able to calm me down and coach me and help me to breath. I felt like i was going to pass out and die! Then i feel asleep to due the drugs. Poor thor is sitting outside hearing me scream, then silence, then 5 mins later heard our baby scream! he was relieved! after 10 mins they let him in the room to hold our baby! My dr. is very good and stitched me up and i hear from all the nurses that it looks so good that i probably wont scar! Due to my infection they put me on 3 different antibiotics since they didn't know were the infection was coming from. They kept me pretty druged up the next day. I dont even remember much from wed. or thursday. I didn't even hold my baby till she was 3 days old! Thor however was able to give miss oaklie her first bath! My fever finally broke and i was able to hold my baby and the dr. came in and said our baby had jaundice and needed to stay in the light for 24 hours. i started balling, i finally got to hold my baby and be a mommy and they take her from me! then the anistisologist came in to our room and apologized! it was shocking because he was so nice! he said that he has been doing this for 30 years and has NEVER seen what happend to me! he said that the epiderals went in text book perfect and he even called some of his friends to try to figure out what went wrong but nobody knew. he said even when he took them out of my back they were perfect and not bent in anyway. so it was nice to have him come talk to us for like a half hour. then he recomended to never try to have a vaginal birth again and to only do c-sections and that he dosent think a spinal would numb me so probably to be put under again! After being on so many drugs i wasnt able to pee and i was in increadible pain! the nurse didn't want to give me a cathider so she put one in just to relieve the pressure and took it back out. well when she did that i peed a liter and a half!!! it felt amazing! then 20 mins later i was in pain again and begged for a cathider to be left in, she said there is no way i still had a lot of pee in me. so she did an ultra sound thing to see how much pee was in u and found that there was at least 8 ml and placed a cathider for the night! My stomach was so swollen i still looked pregnant 3 days after having a baby, thats because i was BACKED up!! it took me 4 days to fart and exactly 1 week to poop!! my dr. actually had to give me stuff to help me go! who knew how much you could appreciate natural body functions! After Oaklie was done with her jaundice treatment my fever went back up to 102 so again i was too weak to really do much with her! after 24 hours of no fever they released us to go home!!! so sunday we all arrived home were my mom was waiting, she came from NJ to visit us and help! we'll monday morning around 4 am my fever came back and my dr. sent me back to the hospital for test and more antibiotics. 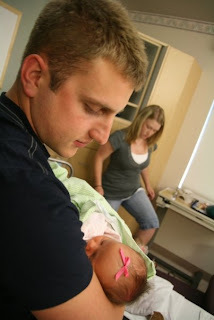 since oaklie had already been released she wasnt allowed to stay in the hospital with me unless someone stayed too. so she stayed at home with my mom and Thor. Thor and Oaklie would come every night for dinner and a movie and i just balled when they left. Finally on Wed. I had been with out a fever for 48 hours and had finished a billion antibitocs so they sent me home yahoo!!! after 1 week and 1 day in the hospital. my dr. has kinda put me on a bed rest so i try to take care of my baby as much as i can but i pass her off to my mom alot so i can rest up! it took a great deal to get her here with a looong crazy pregnancy to a loong crazy birth we finally have our gorgoues little girl!! here are some photos for now! hope you enjoy!!!. oh ps i have the best husband in the world who was there for me the whole time and took care of me and baby while in the hospital! he is now back to work and still does everything he can to play daddy and mommy!! he loves his little girl so much first thing he does when he comes home is picks her up even if i just put her down and she was sleeping! hahah man i love my family!! blahaha my baby has a fohawk!!! 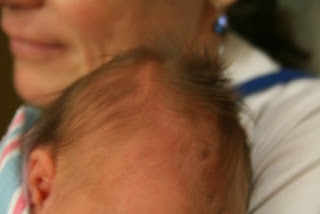 Oh my gosh I can't believe you went through all that; makes me scarred of birth!! haha you go girl! Thor is going to be such a good daddy! aww so excited for you toO! I'm glad you girls are doing well! holy cow, girlfriend. I had no idea you went through that much pain and drama and bodily malfunctions! You are truly wonder woman and sounds like Thor was simply amazing. Enjoy your new bundle of joy! Can't wait to see more and more pictures.